Terra cotta ware made by Brian Wiebe, Kelowna, BC (solarnestarts.com). 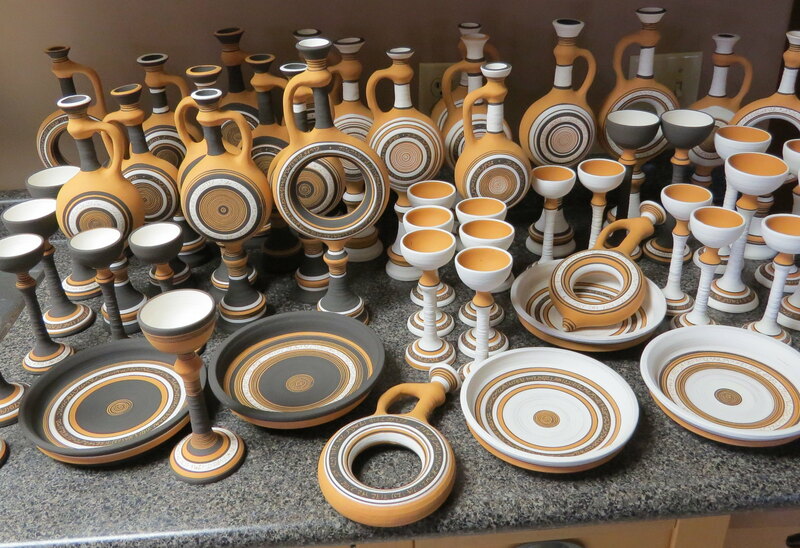 He digs and processes his own clay and employs underglaze decoration and finishes with a transparent glaze. Terra cotta has the longest tradition of any form of pottery. By definition, terra cotta is porous and has a low fired strength. Typically it is unglazed. However with the advent of modern equipment and materials we most often think of terra cotta as red, low temperature pottery clay for use with commercial bottled glazes. It is possible to add frit to terra cotta to make it vitrify at low temperatures (and thus make stoneware). Terrastone: The lightest burning option and the one we recommend to schools. It is a true terra cotta, containing no talc and no barium carbonate. L215: Darker red burning with added talc. The talc improves the fit of commercial glazes (however Terrastone also fits them and it contains none). The strength and color of terra cotta bodies progresses (light red to dark brown) as they mature from cone 06-2. At cone 06 ware is very weak and porous. The brightest red coloration is often around cone 04-03 (02 is a warmer red). The red of terra cotta is one of the most vibrant and exciting surfaces in ceramics (when combined with colored slips, underglazes and glazes). We recommend that you experiment with the entire cone 06-2 temperature range to see all the color possibilities. Ware is not normally fired beyond cone 02 since the color is less interesting and pots become prone to warping and bloating. Transparent glazes can significantly darken the color of terra cotta bodies above cone 03. Thus do not be surprised if you get a brown color through the clear glaze when you expected the toasty orange the body displays without the glaze. Commercial glazes and underglazes are almost always suitable across the entire cone 06-02 range. The advantages of cone 04-03 over 06 are compelling, especially for ware strength. Low-fire zircon and tin white glazes have very good covering power, even on the red body (if you can apply them evenly). Even better, employ a white engobe and glaze over that. Of course, brush work with commercial underglazes is the most common form of decoration. The colors can be applied at the leather hard stage, greatly simplifying the production process. An added benefit of decorating at leather hard is that you can do incised decoration through the colors. Many traditional terra cotta artists make beautiful ware by trailing on multi-colored slips and then putting a clear glaze overtop. Others do incised decoration and fill it will colored slips which they then rub off to restore the smooth surface (the inlaid colored lines provide a good background for the transparent overglaze). A very common complaint, especially from people that have formerly made stoneware, is the necessity to paint on glazes. And how long it takes them to dry. Even special dipping versions of commercial glazes drip badly and dry very slowly (by contrast, stoneware glazes can dry in seconds on dipped bisque ware). Plainsman has recipes and dry powders available for dipping clear glazes for our terra cotta clays and they behave like a stoneware glaze. If you want to ramp up production, this type of overglaze is far superior. Click here for more information. White engobes are applied to terra cotta during leather hard stage. They create a white base onto which to decorate and glaze. The tile industry worldwide uses thousands of tons of engobes. These are tricky to develop since their drying shrinkage, firing shrinkage, thermal expansion and quartz inversion behaviors must match the body. Plainsman has developed separate engobes for our regular and vitreous terra cottas. Click here for more information.